Rising concerns about the fairness of sentences and the expense of running federal prisons have prompted an unusual alliance of Tea Partiers and liberal lawmakers to push for changes in the country’s mandatory-sentencing laws, the Associated Press reports. The bipartisan congressional push comes as President Barack Obama and his Cabinet focus attention on mandatory sentences, specifically for nonviolent drug offenders. 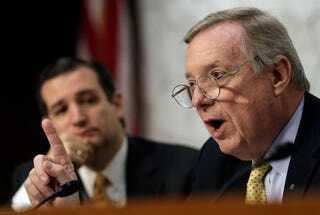 The push is being led by the Senate, where Sen. Richard Durbin, D-Ill., has partnered with staunch members of the Tea Party, like Sen. Mike Lee, R-Utah, on legislation that would give judges room to mete out prison sentences in many drug cases, the AP reports. At the same time, a right-left coalition is also pushing for changes in the House. Prison costs have skyrocketed in the past 30 years, the AP says, when laws requiring mandatory prison time for many drug offenses were instituted. The annual cost for one federal inmate ranges from $21,000 to $33,000, depending on the prison's level of security, the AP says. About half of the nation's more than 218,000 federal inmates are serving time for drug crimes—and virtually all of them faced some form of mandatory-minimum sentencing. Mandatory-minimum sentence are outdated, opponents argue. They combine all offenders into one category and do not allow judges to use their own discretion. The cost is also a factor. The Justice Department spends an estimated $6.4 billion, about a quarter of its budget, on prisons each year, and that number is growing steadily, the AP says. "People are coming here for different reasons, but there is a real opportunity," said Durbin, one of the Senate's leading proponents of sentencing reform, according to the AP.